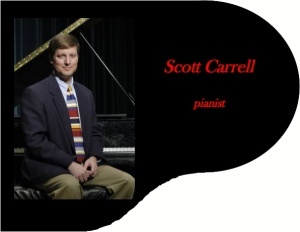 We are most pleased to announce the return of internationally known pianist Scott Carrell to the Fairfield Bay Conference Center in March, 2015. A native of Texas, and currently head of the Piano Department at Harding University in Searcy, Dr. Carrell will once again entertain us with a variety of composer selections. His concert is entitled “A Program of Piano Magic” and will feature classical presentations by such well known composers as Beethoven, Mozart, Chopin, Debussy and Gershwin plus others. The program will include brief discussions of the works as well as the composers. We invite you to join us on March 8, 2015, at the Fairfield Bay Conference Center, 110 Dave Creek Parkway in Fairfield Bay at 2:00 PM, for what will certainly be a relaxing and enjoyable afternoon. The concert is sponsored by North Central Arkansas Foundation for the Arts and Education (NCAFA&E), well known for bringing quality artists to our community and surrounding schools asking only for donations. We look forward to spending the afternoon with each of you.